The results of the Meeting of the Commissions for Dialogue between the UAOC and the UOC (KP) turned out a pleasant surprise. First of all, it was thanks to the new conditions offered by the Kyiv Patriarchate. The last UAOC Council demonstrated the anarchic, so to speak, nature of our Church. It is something very lively and traditionally Ukrainian in its mentality. However, at the same time it is something unmanageable, chaotic… Considering such circumstances, unification would seem simply impossible. On the one hand, there is the “Orthodox Cossack free rein,” and on the other hand there is non-compliance and an obstinate desire to attach the other side instead of uniting with her. However, having looked at the conditions of the proposed “union” between the UAOC and the UOC KP, I got pleasantly surprised. The politics of Constantinople today gives reasons for optimism. 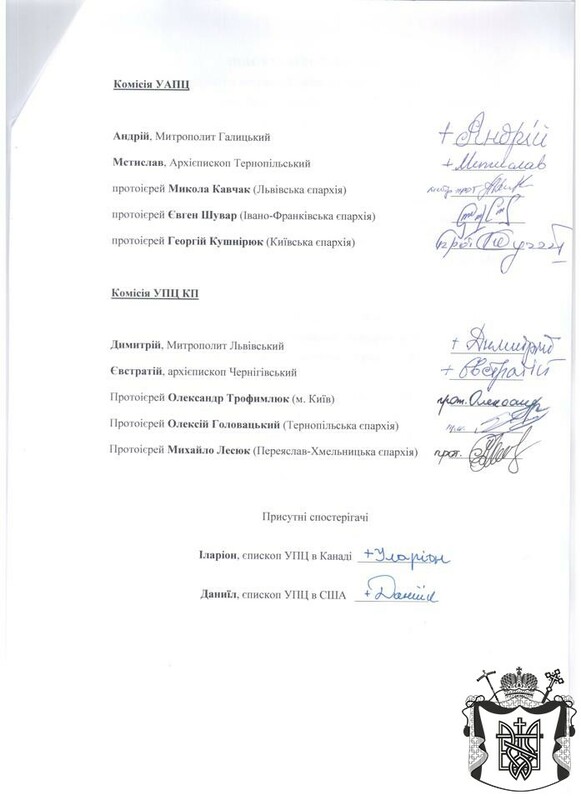 Here I mean the fact that under the decision of the Commissions for Dialogue there are not only the signatures of Metropolitans Andrew and Dimitrios, but also of the bishops of the Ecumenical Patriarchate. This is a symbolic step. At the same time, it is a great responsibility of both sides before Patriarch Bartholomew. What will turn out more important for the bishops – their own interests or the interests of the Church, i.e. the perspective to serve in a single national church recognized by Universal Orthodoxy? I remember the words of His Beatitude Methodius, who said that for the unity and the status of the Church in the Universal Orthodoxy he was ready to leave his post at any moment. Now it is time to see how sincere and responsible the similar words of Metropolitan Macarius were. Recently I have rather firmly criticized the position of Metropolitan Macarios. This was my reaction to the second day of the UAOC Council’s work. However, I am a just person. And if the Metropolitan keeps his word, if he indeed agrees to the real unification and makes use of the conditions proposed to him today, I will be proud of such actions of the new UOAC Primate. The presence of Metropolitans Ilarion and Daniel testifies to the fact that the negotiations process happens under patronage of the Ecumenical Patriarch. Thus, by God’s grace this condition of the Testament of Metropolitan Methodios is fulfilled. 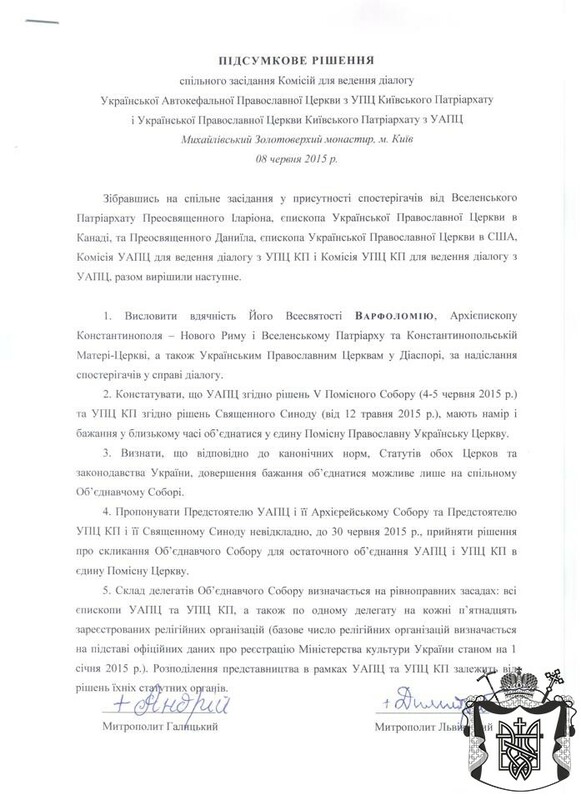 As for the dialogue with the pro-Ukrainian part of UOCit is not going on at the moment, to tell you the truth. Metropolitan Macarios decided that the dialogue with Metropolitan Onuphrious, whom he publicly promised to persuade to drift apart from Moscow, will be more effective. Well, that is a noble task, although an absolutely impossible one, in my opinion. However, winners are not judged. If Metropolitan Macarios manages to persuade metropolitan Onuphrius to drift away from Moscow, I will bow down at his feet. And today I would like to express appreciation to Metropolitan Andrew, who presided the negotiations process with the UOC KP. After all years of the dialogue in the past, finally we have managed to come to worthy conditions for the unification, also because and thanks to the diplomatic talent of Metropolitan Andrew, who managed to achieve positive results in the negotiations process with the Kyiv Patriarchate. In the end, I would like to mention another small but pleasant thing. After I criticized the Appeal of our Local Council to the President it disappeared from the website of the Lviv diocese of the UAOC. They say they are remaking it so that it becomes more discreet. They are removing words about “blackmailing” and “threats,” which were addressed to the Cabinet of Ministers and the Administration of the President. I am thankful to the bishops that they had listened to my criticism. When people take criticism in a constructive way, it witnesses that they are not proud but humble in their spirit, and that they do not think and care for themselves, but for the interests of the Church.